The world has watched stunned at the bloodshed in Mexico. Thirty thousand murdered since 2006; police chiefs shot within hours of taking office; mass graves comparable to those of civil wars; car bombs shattering storefronts; headless corpses heaped in town squares. And it is all because a few Americans are getting high. Or is it? The United States throws Black Hawk helicopters and drug agents at the problem. But in secret, Washington is confused and divided about what to do. Who are these mysterious figures tearing Mexico apart? they wonder. 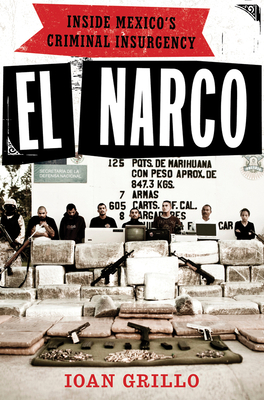 What is El Narco? El Narco draws the first definitive portrait of Mexico's drug cartels and how they have radically transformed in the last decade. El Narco is not a gang; it is a movement and an industry drawing in hundreds of thousands from bullet-ridden barrios to marijuana-growing mountains. And it has created paramilitary death squads with tens of thousands of men-at-arms from Guatemala to the Texas border. Journalist Ioan Grillo has spent a decade in Mexico reporting on the drug wars from the front lines. This piercing book joins testimonies from inside the cartels with firsthand dispatches and unsparing analysis. The devastation may be south of the Rio Grande, El Narco shows, but America is knee-deep in this conflict. A native of England, Ioan Grillo has covered Mexico since 2001 for top newspapers, magazines and TV stations in the US and UK. He reports for "Time" Magazine as well as producing presentations for stations including PBS, ABC and Channel 4 of the UK. He regularly appears on radio and TV, commenting on Mexican crime and other issues. He has witnessed police and military operations, mafia killings and major seizures; he's also discussed the drug war with two Mexican presidents, three attorney generals and the U.S. ambassador, among others.